This exhibit has surpassed all prior exhibit records for the number of visitors, and I can't ever remember seeing lines so long in front of the Met and snaking through the galleries waiting to be admitted to the Galleries. By mid-July they were reporting a half-million visitors entered the McQueen galleries. And the last two evenings of the exhibit this week, the Met is staying open until Midnight! 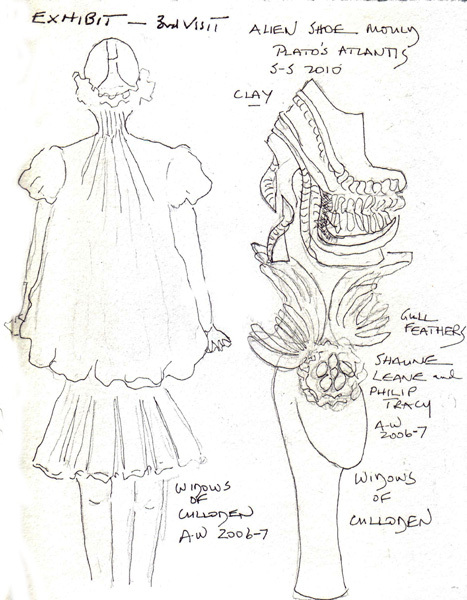 Alexander McQueen (1969-2010) had amazing creativity, even though his clothes were more like costumes than clothes to wear, even for the "fashionistas." The runway shows for every new collection were spectacles and it is fascinating to see videos of the shows, in the exhibit, along side the clothes and their accessories. 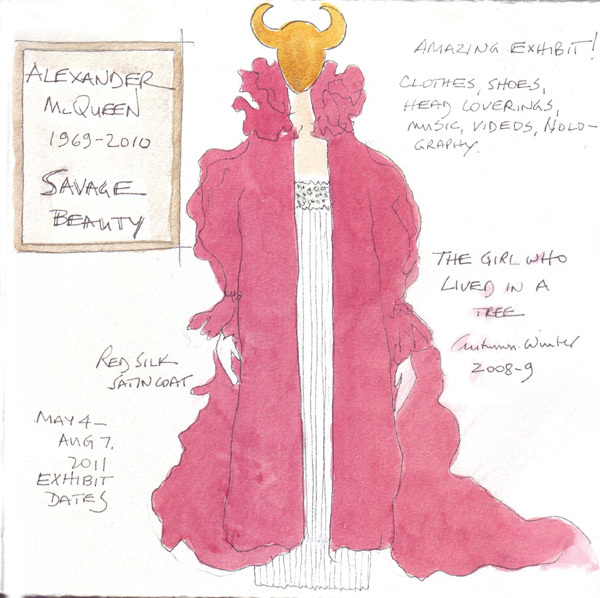 The Metropolitan Museum of Art website for the exhibit is fabulous and you might enjoy seeing the fashions, the videos, and the quotes from McQueen himself. 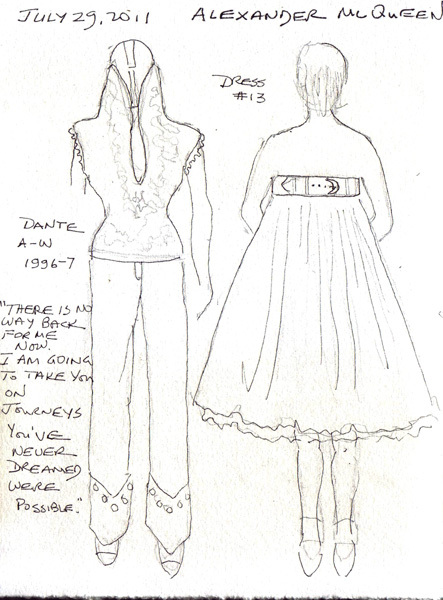 I have been several times and even standing shoulder - to - shoulder managed to sketch a few of the garments. I haven't painted some of the pages yet, but I haven't even decided if I will. 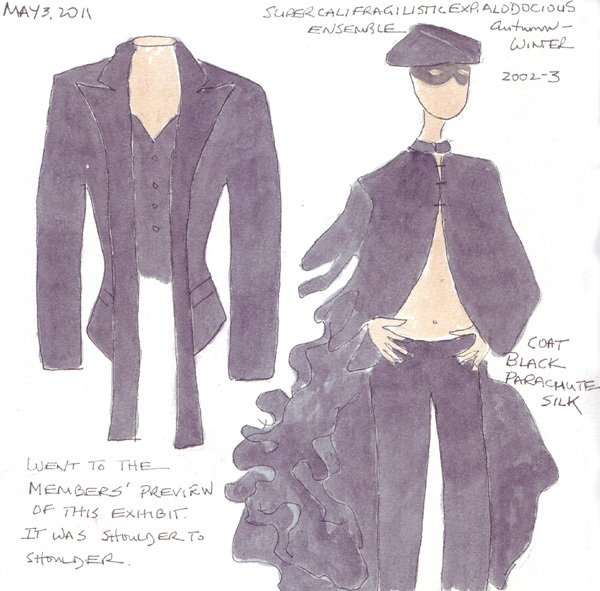 The second garment, the long black coat, is constantly blowing up around the mannequin - a very effective way to show the fullness and construction. The coat from the garment on the left is made of duck feathers painted gold. It was designed before McQueen's suicide and was only shown, after his death, to small groups of friends in a very small private venue. I painted it with gold gouache, but the metallic sheen doesn't scan. In the gallery there are 5 mannequins dressed in his final designs - and they appear in a large glass enclosed space that represents a huge gold casket. The garment on the right is from his final runway show - Plato's Atlantis - and the designs were inspired by the fabrics he made. This one is composed of images from snake skins. My painting really looks very little like the exquisite fabric. The final two sketchbook pages were done last Friday - and just represent images that I liked. The second dress from the left was white, with a tan belt around the top. Then it was painted during the runway show - and you can see the amazing production here in this very short video. It is the 5th video on the page - No. 13 Spring-Summer 1999. 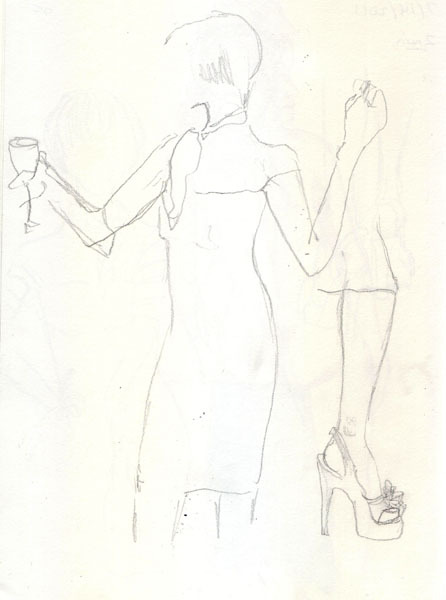 The shoe that I sketched on the upper right is actually a clay mould for ceramic shoes worn by models in the runway shows. And they weren't even the most extreme shoes that the poor models had to wear! 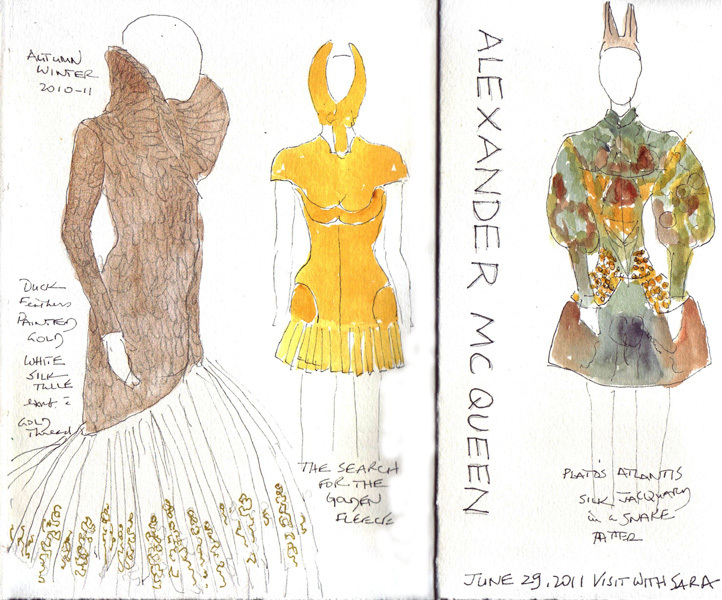 Hope you enjoy this brief visit - and can appreciate the genius of Alexander McQueen. The heat in NYC was unbearable Friday, Saturday, and Sunday. So even though we rarely go to the movies, my husband and I went to see Woody Allen's new movie "Midnight in Paris. It was great - especially the fabulous Paris scenes that started the minute it opened and didn't end until the final second! 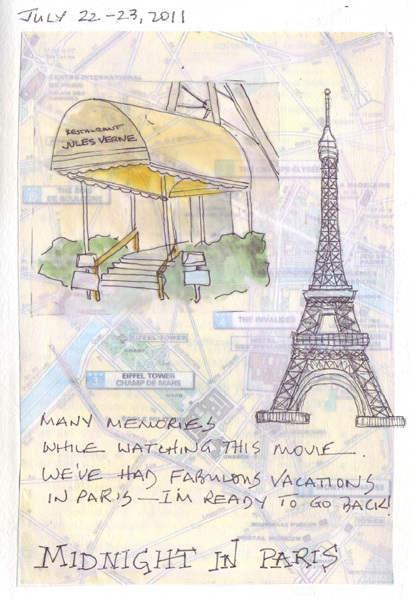 So many memories of our vacations there flooded into my mind and I came home wanting to do a Paris journal page. Our last trip there was in February 2005 and I wasn't keeping travel sketchbooks then. I always wanted to draw the Eiffel Tower, but was almost paralyzed by the complexity of the construction in my photos. So I searched for Eiffel Tower drawings and actually found a tutorial - which was just perfect. I decided to scan and print a Michelin Paris Guide map for the first layer, then absorbent ground to partially cover it, and finally ink and watercolor drawing/painting. This is a technique that I saw on Jane LaFazio's blog in 2010 and use periodically in my journals. 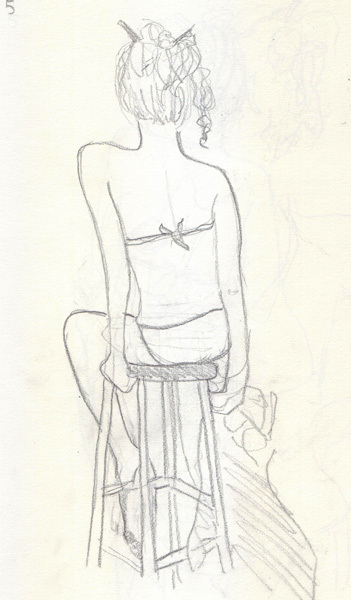 The models this Thursday at the Society of illustrators sketch night were dressed for the beach - with a parasol, sunglasses, tropical drinks, wraps, and flip-flops. These were fun accessories to draw and the models were just great. 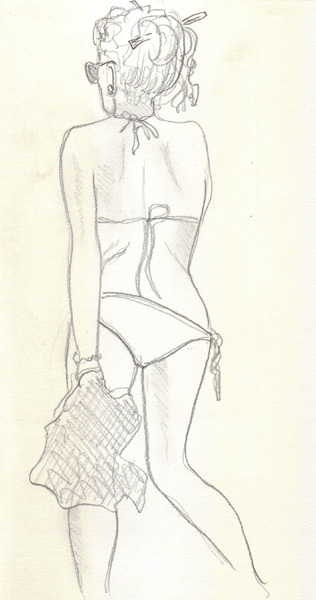 Nineteen sketches were done, but I'm only uploading several - all of the same model. 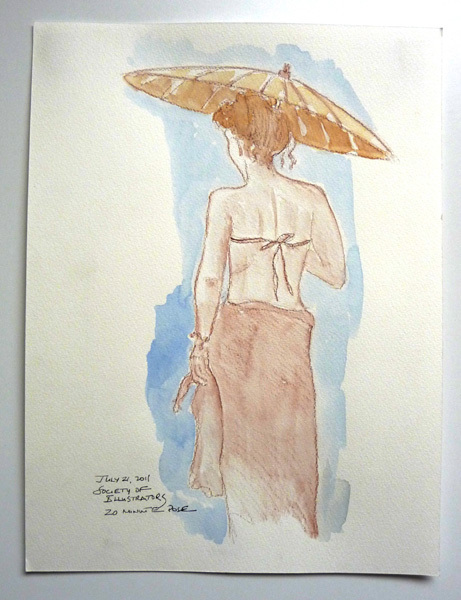 I switched to a watercolor pencil for drawing and large sheets of watercolor paper for the 20 minute minute poses and used the time to draw the models and shade and paint the sketches. This seems like a good way to work with watercolor before I'm ready and able to "sketch" the figures with my brush. 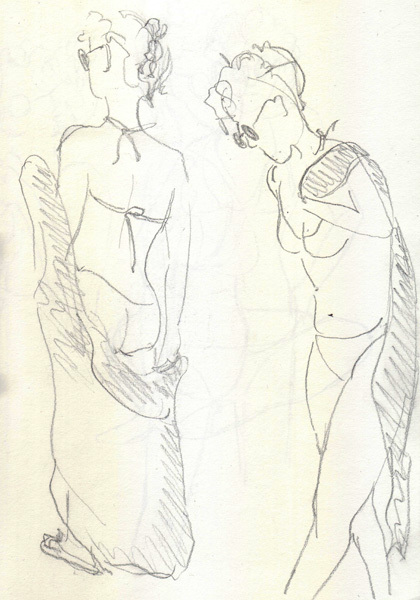 These sketches were photographed because the paper is bigger than my scanner. I am posting several journal pages that I did recently, to include some variety on this blog. 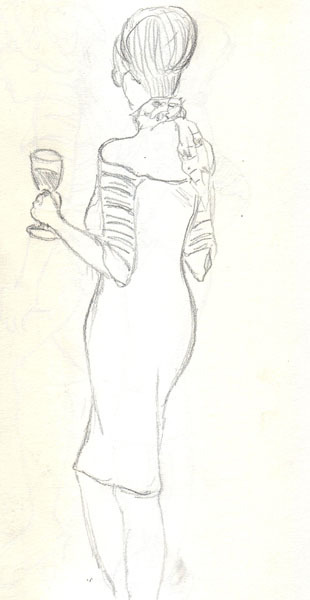 Tonight will be my last figure drawing session until after Labor Day, so my next blog entry will be more drawings from Sketch Night in costume. This plant was a gift from friends and it just keeps flowering. 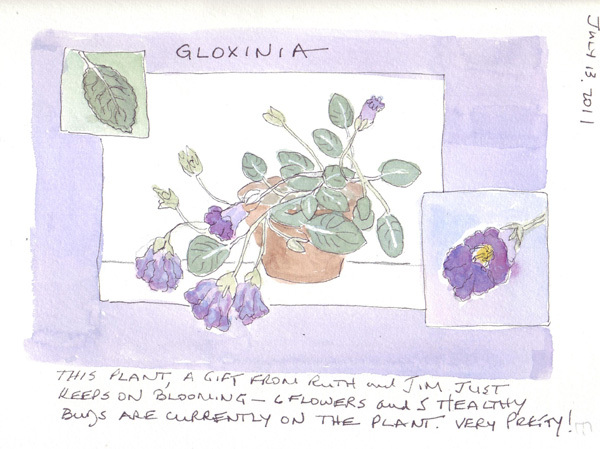 I read about gloxinias and know that they need to die back and hibernate later in the season. I only have one set of windows that have a wide window sill and enough light, so I'm afraid that this plant will not be with me next year. I'll try to repot it next Spring, but would love to hear what others do with their indoor gloxinias. I'm still sending weekly postcards to my dear friend Melly as she enters phase 3 of her breast cancer treatment. 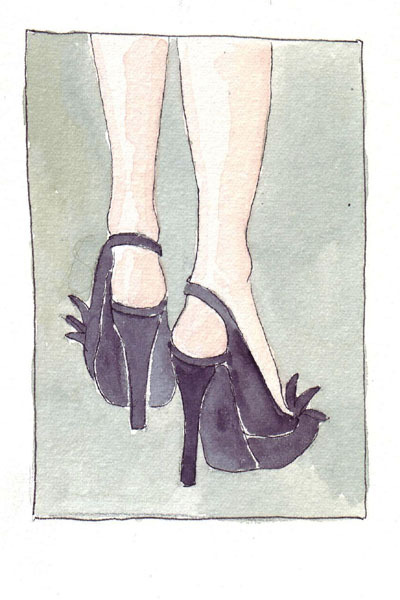 She recently mentioned "dancing" when all of this is over, so I redrew my model's shoes from last week and painted them for her for last Saturday's postcard. I hope they make her laugh! Neither of us are the 5 inch spiked heel type of lady. Sketch Night on Thursday night at the Society of Illustrators is a great change because both models are in costume - partial or complete. This past Thursday was Bastille Day and they both wore French-inspired dresses, very high heels, and wigs. Props included a baguette, wine bottle and two glasses of wine. Here are a few 2 min sketches, one 5 min sketch, and one of the 20 minute sketches which was drawn and colored with watercolor pencils.